Passiv is a tool to help you manage your investments more easily. It’s still a DIY idea: you make your own investment choices, pick your own funds, and have to press a button to execute the trades, but Passiv makes it all easier to manage on an ongoing basis. In a nutshell, if other robo-advisors are like chauffeurs for your portfolio, Passiv is like cruise control. Passiv doesn’t pick any funds or your allocation for you, and there are no advisors to call or email to answer questions about your plan or risk tolerance, but it helps make investing easier. 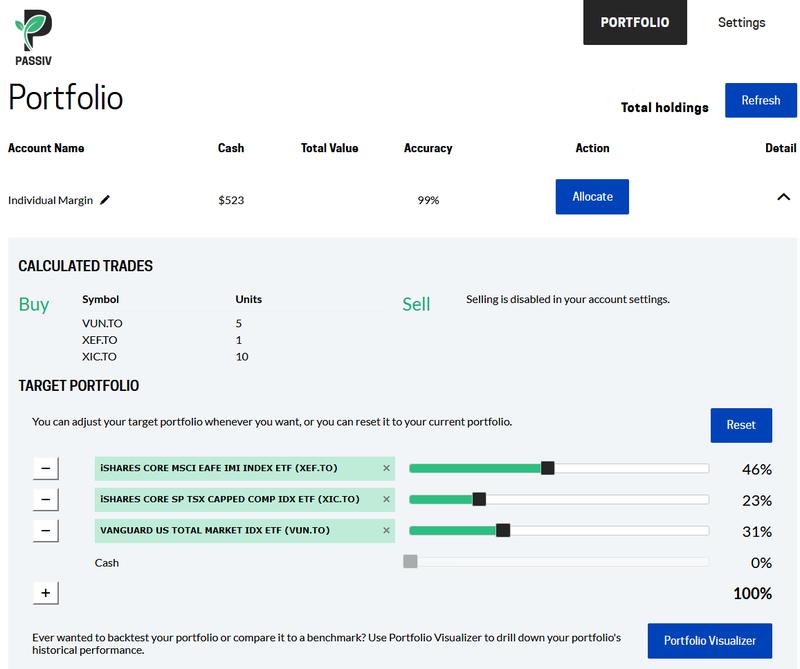 Very simply, Passiv connects to your Questrade account to get the information needed to help manage your portfolio in a more intuitive way. You set your own allocation and pick your own products. But Passiv helps bury some of the complexity of investing in ETFs: it lets you drag a slider to set your allocation in percentages, instead of having to look up the prices and figure out how many units of each fund to buy yourself. It does the rebalancing calculations for you, and will figure out how much of each ETF to buy with new money, and you can choose whether to only rebalance with new purchases, or to include selling funds. It will send you an email when new cash arrives in your brokerage account, providing the prompt needed to go in and set up your trades — not quite fully automated, but getting pretty close. Indeed, while I personally feel like I was doing fine unaided, this feature alone is cool enough that I’m going to keep using it (because then I don’t have to keep in the back of my head that I should check Questrade 3-5 days after I send money via a bill payment). And it can even set up a series of (market) orders to execute it all for you in just one click. That’s a paid feature, but at just $5/mo it can take a lot of that last lingering complexity out of the picture that might be scaring someone away from using a brokerage account and ETFs. And the cost is low enough that you don’t really need to worry too much about the precise break-even point for this versus Tangerine or e-series or whatever. The way it simplifies investing in ETFs while giving you full control is kind of like having a robo-advisor in your pocket. 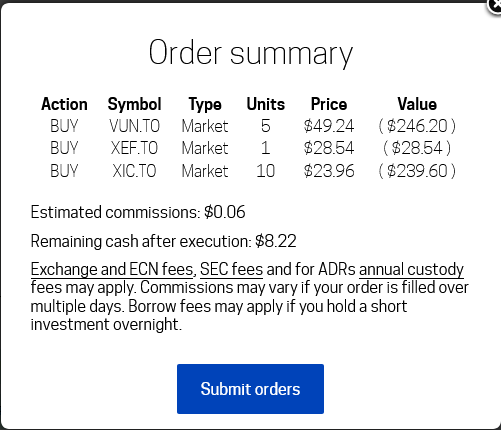 Combine with VGRO/VBAL to make something that’s cheaper than e-series (for portfolios of ~$30k+) and almost as easy (not quite automated, but close). The automatic trade feature buries a fair bit of the complexity associated with buying ETFs, and an email prompt to log in and press one button is approaching (but not quite the same as) the behavioural goodness of automation. While you can also choose a 3- or 4-ETF portfolio and have Passiv smooth over the complexity, it’s even fewer things to track if you want to use an all-in-one fund, and also has the benefit of hiding the relative performance of the constituent parts. Passiv uses what’s called an API to access certain information about your Questrade account from Questrade, and (with your permission) to send orders. If you’re not familiar with how APIs work, what you need to know is that there’s a special way for Questrade to securely hand off some information, but that you are not providing your password to Passiv nor full access to your account. At the moment, Questrade is the only brokerage Passiv interfaces with. If you can’t help but dabble in individual stocks (or sector ETFs or whatever), Passiv lets you exclude some items from calculating your rebalancing needs. That is, you can focus on keeping your core in line (and in one click deploy new cash to those ETFs) while still playing around on the side, and not have to worry about an automatic calculation deciding that you need to plow more money into your loser picks (or trim your winners) in the name of re-balancing. And the Passiv team has created a special offer for BbtP readers: a 10% discount on Passiv Elite. Disclosure: I did not receive any payment for this post — I know it sounds like an ad, but I genuinely like the tool. At the time it was written there was no conflict-of-interest with Passiv. However, we are talking about working together somehow, so there may be a conflict in the future. I do not receive any compensation if you use the link for the special offer. Blessed by the Potato is proudly powered by WordPress ♦ Entries (RSS) and Comments (RSS). ♦ 26 queries. 0.392 seconds.